This is a stream of thought post on old school methods. I may do more of these if I get comments. In my desk I keep a Moleskine notebook I got on Amazon for way too much, it’s the one in the thumbnail. I started keeping this thing several years ago to keep track of fixes at work. Most of my contemporaries thought I was sort of nuts for doing so as keeping handwritten notes as a sysadmin is laughably old school. So are all nighters because you can’t remember how to fix something, but no one seems to see the irony. I started writing some how-to stuff on ShoreTel and Cyberoam earlier this year because finding such information was hard to do. A lot of my articles are actually refinements of what I’ve written in my little journal. I wanted to give back and some of this stuff is near impossible to find anywhere on the internet except here and perhaps if you dig REALLY deep into some forums. Much was gleaned from conversations with tech support operators. So why did I keep it? Well the biggest reason was my last job had very little opportunity to digitize it and I needed a way to reference things quickly. The reason now is that when someone shows me how to do something, or I’m working my way through a problem, it is a lot easier to write it down with a pen then type up the notes. I’ve heard it’s easier to remember something if you read it, write it down and then do some action based on that information. It sort of sticks with you forever. I don’t personally find the same retention when you type things up in a knowledge base. Also how many small or even medium and large size IT departments keep good documentation anyway? I probably failed about a dozen interviews because I’d always ask if they documented things and the interviewers would sort of blush, look at their feet and say, “No, not really, but we should.” I just quit asking and then I started getting hired. Even when they do keep documentation, many times their help desk system is not reliably backed up, nor is the documentation feature reasonably implemented. I think this is in large part due to when a fix is found the IT staff go home early after two straight days of no sleep because their SQL server crashed because the battery backup failed, and they didn’t have a system that could reliably come up from a power failure (translation: a bad system). Documenting what fixed it is HARD, especially when you are hallucinating due to sleep deprivation. So I keep hand written notes, because short of a fire or something, they are hard to destroy, and it’s a bit easier to work with than a folder full of inconsistently named Word documents, especially when those documents are on the system that failed. 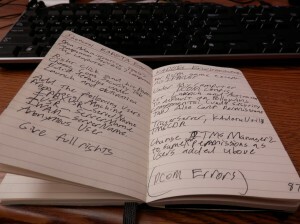 I do have a method to my note keeping, even though it isn’t clear from looking at the notebook. It’s something I’ve come up with over the last few years and goes back to how my dad taught me to keep track of stuff. The first thing I do is get a little, durable notebook. 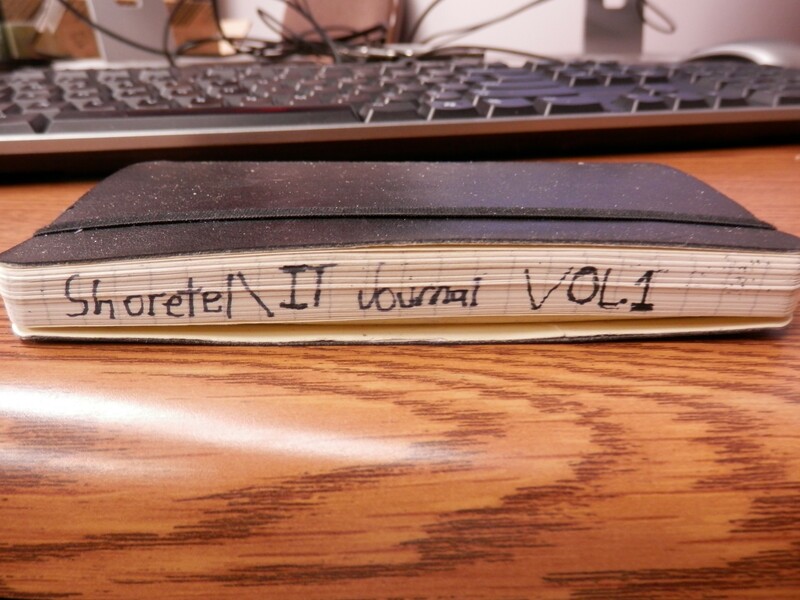 I like Moleskine soft cover notebooks because they can take a beating. I’ve got one I keep recipes in that has had everything short of straight battery acid spilled on it and it is still intact. The Piccadilly notebooks are pretty good too, and cheaper, but harder to find. Also I like the small pocket-sized ones because they fit well in a tool bag, or pants pocket. There are some engineering field notebooks out there too, but I’ve never had one to use. Expect to spend at least $10 on any of these. Once I’ve got the notebook I number all the odd pages. I picked this hint up from Lifehacker. You don’t need to number all the pages, and if you will notice from the below picture all the odd numbers are on the right hand page so it’s a lot easier to do. It doesn’t take a genius to figure out the page on the left is the even-numbered page before it. The next thing I do is just start adding stuff and not worrying about how many pages it takes up, although it works best when notes on a subject take up two pages. I don’t worry about when or where I add things, trying to keep ShoreTel stuff on pages 1 – 50, Cyberoam stuff on pages 51 – 100 and so on is not going to work and really limits what you can put where. The trick is in the table of contents. On separate pieces of half page notebook paper I keep in a pocket on the back I write all the subjects down along with page numbers. Then on a separate sheet of paper for each category (Shoretel, Microsoft, Cyberoam, Cisco, etc.) I put the relevant subjects and page numbers on those. 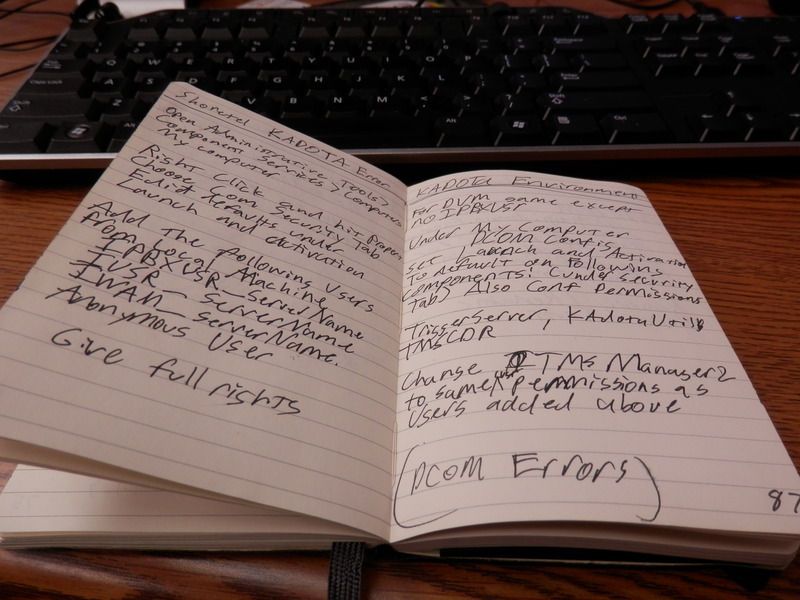 I just keep adding to the notebook and every so often updating the cross-reference on the pieces of notebook paper. When I need to look something up I check this index in the pocket, find the topic and page number and I have what I need. Of course this isn’t as extensive as Googling every problem. But if I know I’ve fixed it before I can typically find what I need long before everyone else is done fumbling with their phones. Now I do want to clarify. I am not some old guy that just scoffs at newfangled things like “Googling” and “Not Including A 2000 Page Manual With Every Device Like They Do In The Military”. Search engines are wonderful and account for 95% of how I find fixes and other information. Please, use them, but don’t forget the old school methods because even if you’re 22 and an awesome tech, your memory is not as good as you think it is. Those things you only fix once or twice every few years will slip from your mind and when you need to remember them you won’t have your phone, internet access and the document you typed up on it in 2010 will be on that hard drive that just stopped spinning. Oh and someone will have stolen your precious disorganized “IT Binder” you keep in the filing cabinet. Also you might be thirty feet underground in a muddy maintenance tunnel for an ancient building staring up at a crude four-inch hole with nothing but a flashlight trying to remember what cable went where. All this while the people who know figure out too late that their walky-talkies can’t penetrate eight feet of bomb shelter grade reinforced concrete. You’ll wish that Moleskine notebook was in your pocket, I promise.